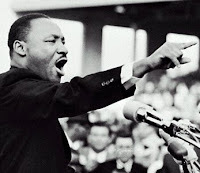 Martin Luther King Day is also known as Human Rights Day and as Civil Rights Day. The day is marked by demonstrations for peace, social justice and racial and class equality, as well as a national day of volunteer community service. You only need a heart full of grace....a soul generated by love....you can be that servant." Please visit The King Center today.